Appearance: (6.5) Despite the dark iPhone photo, we very much appreciated the varied color palette and visibly oozy cheese. Not much else was oozy, unfortunately, and we briefly worried that they had forgotten the chili. Quality of Ingredients: (8) Something was certainly afoot in the chili tonight…though it claimed to have “beef, sausage and beans” we had trouble distinguishing any of these purported ingredients. Opinions were mixed on the chips…some found them light and crisp, others stale. We loved the pico de gallo in all its plentiful, freshly-cut vegetable glory. The guacamole too was a delicious addition on top. Distribution of Toppings: (6) While there was plenty of cheese, the chili really didn’t do its job, and there were lots of naked chips. The cheese was certainly well-melted and plentiful, and the copious pico also helped to cover up those poor, barren chips. Once again, the glob of sour cream on top was entirely unwanted and unhelpful. Price: (4) At $9, with an extra $4 for chicken or chili, these are at the high end of the spectrum. While we aren’t opposed to paying for value, the extra near-50% increase for toppings just didn’t seem worth it. 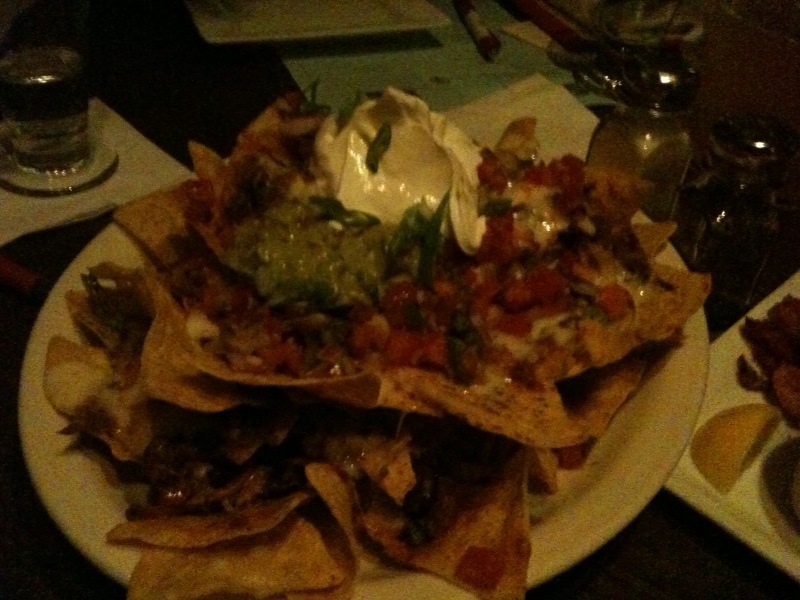 When a trivia companion arrived late and ordered a second plate of nachos, sans accouterments, we barely noticed the difference. Shenanigans! Overall: 24.5/40. These were tastier than their score suggests, but the price-gouging really brings them down. ← Hearing the boom (coming out your…nacho? )!